As the Obama administration takes office it is instructive to assess the extent of divisions between the United States and European governments on Middle East policy that emerged in the wake of the terrorist attacks of 9/11. In the years since the invasion of Iraq, the issue of democracy promotion in the Middle East has often been a focus of discussions over the breach in transatlantic relations — sometimes presented as a major cause of discord, sometimes as the stepping-stone to renewed harmony of purpose (Asmus and Pollack 2002: 3–18; Kopstein 2006: 85–98; Drozdiak 2004: 30). 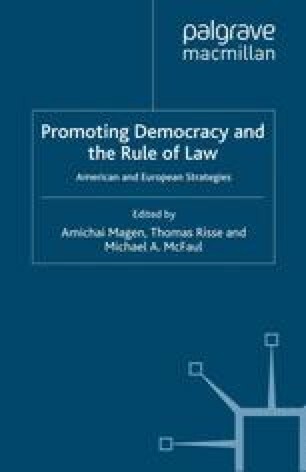 Within the context of the issues explored in this volume, the Middle East is significant in presenting itself — apparently — as the case par excellence of transatlantic divergence over democracy promotion. Rice, C. (2005) “Remarks at the American University in Cairo,” Cairo, Egypt, June, 20, available at www.state.gov/secretary/rm/2005/48328.htm.